In a recent strategy meeting we attended with the leaders of a Fortune-500 company, the word “culture” came up 27 times in 90 minutes. Business leaders believe a strong organizational culture is critical to success, yet culture tends to feel like some magic force that few know how to control. So most executives manage it according to their intuition. We’ve found that answering three questions can help transform culture from a mystery to a science: 1) How does culture drive performance? 2) What is culture worth? 3) What processes in an organization affect culture? In this article, we address each of these to show how leaders can engineer high-performing organizational cultures — and measure their impact on the bottom line. How does culture drive performance? After surveying over 20,000 workers around the world, analyzing 50 major companies, conducting scores of experiments, and scouring the landscape of academic research in a range of disciplines, we came to one conclusion: Why we work determines how well we work. One 2013 study illustrates this well. Researchers asked almost 2,500 workers to analyze medical images for “objects of interest.” They told one group that the work would be discarded; they told the other group that the objects were “cancerous tumor cells.” The workers were paid per image analyzed. The latter group, or “meaning” group, spent more time on each image, earning 10% less, on average, than the “discard” group — but the quality of their work was higher. Reshaping the workers’ motive resulted in better performance. Academics have studied why people work for nearly a century, but a major breakthrough happened in the 1980s when professors Edward Deci and Richard Ryan from the University of Rochester distinguished the six main reasons why people work. We built on their framework and adapted it for the modern workplace. The six main reasons people work are: play, purpose, potential, emotional pressure, economic pressure, and inertia. The work of many researchers has found that the first three motives tend to increase performance, while the latter three hurt it. 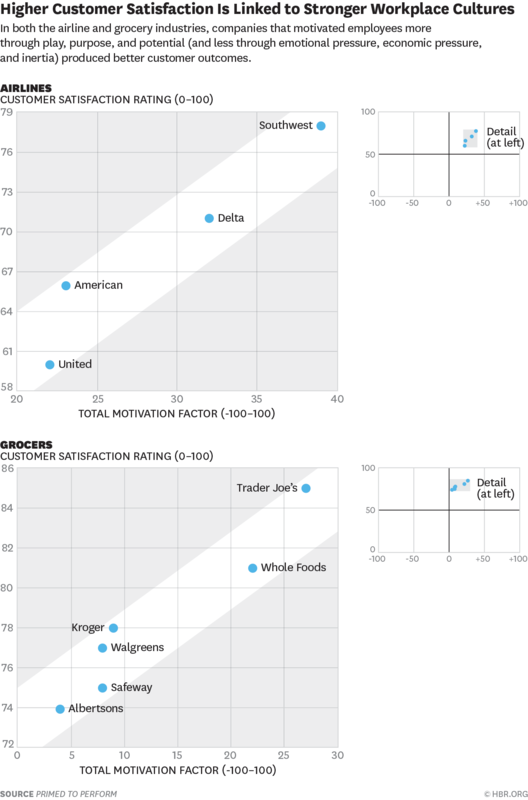 We found that the companies most famous for their cultures — from Southwest Airlines to Trader Joe’s — maximize the good motives, while minimizing the bad ones. Play is when you are motivated by the work itself. You work because you enjoy it. A teacher at play enjoys the core activities of teaching — creating lesson plans, grading tests, or problem solving how to break through to each student. Play is our learning instinct, and it’s tied to curiosity, experimentation, and exploring challenging problems. Purpose is when the direct outcome of the work fits your identity. You work because you value the work’s impact. For example, a teacher driven by purpose values or identifies with the goal of educating and empowering children. Potential is when the outcome of the work benefits your identity. In other words, the work enhances your potential. For example, a teacher with potential may be doing his job because he eventually wants to become a principal. Since these three motives are directly connected to the work itself in some way, you can think of them as direct motives. They will improve performance to different degrees. Indirect motives, however, tend to reduce it. Emotional pressure is when you work because some external force threatens your identity. If you’ve ever used guilt to compel a loved one to do something, you’ve inflicted emotional pressure. Fear, peer pressure, and shame are all forms of emotional pressure. When you do something to avoid disappointing yourself or others, you’re acting on emotional pressure. This motive is completely separate from the work itself. Economic pressure is when an external force makes you work. You work to gain a reward or avoid a punishment. Now the motive is not only separate from the work itself, it is also separate from your identity. Finally, inertia is when the motive is so far removed from the work and your identity that you can’t identify why you’re working. When you ask someone why they are doing their work, and they say, “I don’t know; I’m doing it because I did it yesterday and the day before,” that signals inertia. It is still a motive because you’re still actually doing the activity, you just can’t explain why. These indirect motives tend to reduce performance because you’re no longer thinking about the work—you’re thinking about the disappointment, or the reward, or why you’re bothering to do it at all. You’re distracted, and you might not even care about the work itself or the quality of the outcome. We found that a high-performing culture maximizes the play, purpose, and potential felt by its people, and minimizes the emotional pressure, economic pressure, and inertia. This is known as creating total motivation (ToMo). Take, for example, an experiment conducted by Teresa Amabile at Harvard. She assembled a group of poets to write a simple short poem on the topic of laughter. Before they wrote anything, she had one group read a list of “play” reasons for being a poet (“you enjoy the opportunity for self-expression” or “you like to play with words”), and she had the other group read a list of emotional and economic pressure reasons (“you want your writing teachers to be favorably impressed with your writing talent” or “you have heard of cases where one bestselling novel or collection of poems has made the author financially secure”). She found that the play group created poems that were later deemed about 26% more creative than the poems of the pressure group. The play group’s higher total motivation made a difference when it came to performance. We determined the weighting of each motive by conducting regressions between each motive and performance across industries, and then simplified to build a simple metric that ranges from -100 to 100. The weights demonstrate that the closer the motive is to the work itself, the more it drives performance. You can measure your ToMo or your team’s ToMo using a survey on our site. Creating a business case for culture isn’t impossible. While it is difficult to measure whether someone is being creative, proactive, or resilient in the moment, it’s actually not difficult to calculate total motivation. Using six questions, one for each motive, we can compute an organization’s ToMo using very simple math (see the sidebar for the calculation) and then determine its impact on performance. Take for example the airline industry. Players share the same terminals and use the same planes, but customer satisfaction differs widely across carriers. When we measured the total motivation of employees of four major airlines, and compared their cultures with an outcome like customer satisfaction (as measured by the ACSI / University of Michigan), we saw that an organization’s culture (as measured by ToMo) tightly predicted customer satisfaction. In other words, cultures that inspired more play, purpose, and potential, and less emotional pressure, economic pressure, and inertia, produced better customer outcomes. We saw this play out in retail, banking, telecommunications, and the fast food industry as well. And the impact isn’t limited to customer satisfaction. In one hedge fund, the highest performing portfolio managers had higher total motivation. And in one retail organization we worked with, we found that the difference between a low-ToMo and high-ToMo sales associate was 30% in revenues. 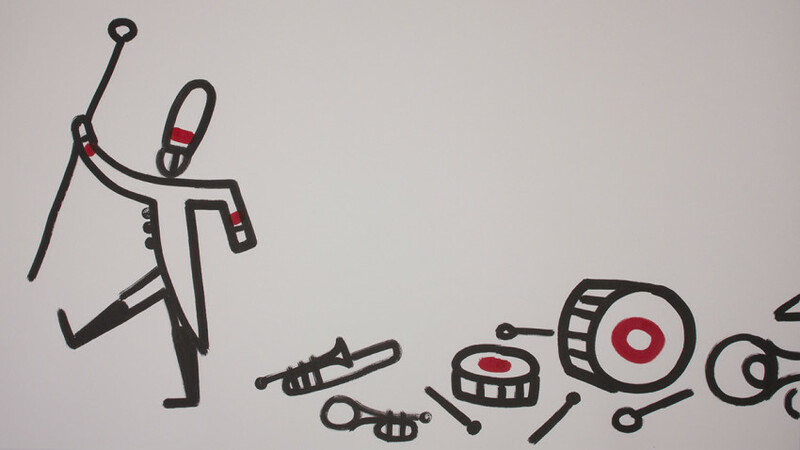 What processes in an organization affect culture? There is no silver bullet. Many processes affect people’s ToMo at work. By surveying thousands of US workers, we measured how much the elements of a workplace — from how a job is designed to how performance is reviewed — affect ToMo. What the chart shows is that while we tend to think that leadership matters most to motivation, other processes can have an even bigger impact. The x-axis shows the ToMo scale (which goes from -100 to 100). 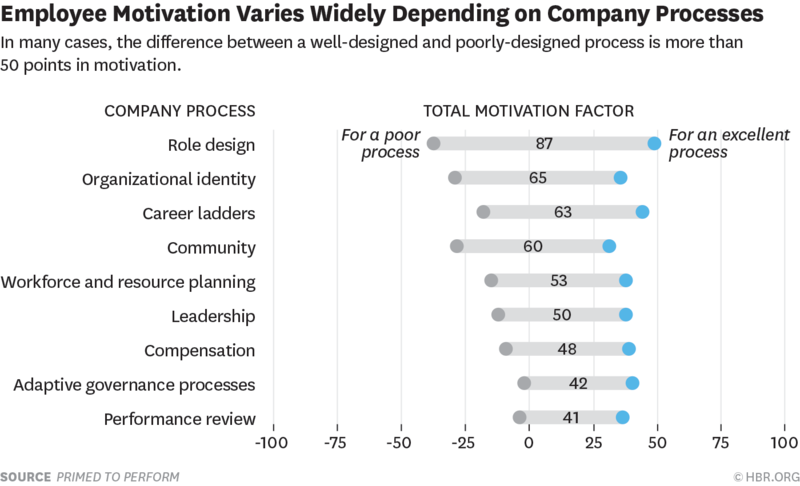 The grey bars represent the range to which each process affects an employee’s total motivation, as gathered from survey responses. For example, how a role is designed can swing total motivation by 87 points. A badly designed role results in ToMo scores as low as almost -40, whereas a well designed role can result in a ToMo as high as almost 50. That’s huge, given that in many industries, the most-admired cultures tend to have 15 points higher ToMo than their peers. Some companies make special efforts to design a highly motivating role. Toyota encourages play by giving factory workers the opportunity to come up with and test new tools and ideas on the assembly line. W. L. Gore & Associates gives people free time and resources to develop new ideas. And Southwest Airlines encourages their people to treat each customer interaction as play — perhaps you’ve seen how some flight attendants have turned boring safety announcements into comedy sketches. The next most sensitive element is the identity of an organization, which includes its mission and behavioral code. For example, Medtronic enables its engineers and technicians to see the medical devices they’ve made in action, so that they can see the purpose of their work. The Chief Talent Officer at UCB Pharmaceuticals told us how he recently started inviting patients to executive meetings, so the people making decisions can see how their work makes a difference. And a Walmart executive told us that he kicked off management meetings by reviewing how much money his division had saved customers—rather than how much money Walmart had made. The third most sensitive element is the career ladder in an organization. Recently, many companies have concluded that their system of evaluating their people, which drives the promotion process, tends to destroy performance. Systems where employees are stack-ranked or rated against each other will increase emotional and economic pressure, reducing total motivation and thus performance. As a result, companies from Microsoft to Lear are moving away from performance review systems that foster unhealthy competition. Culture is an ecosystem. The elements of culture interact with and reinforce each other. One example is sales commissions. In general, we found that having a sales commission decreases the ToMo of an individual. However, if that individual also believes that their work materially helps their customers, the commission increases their ToMo. This makes sense through the lens of total motivation: if you don’t believe in what you’re doing, the commission becomes your motive. That’s low-ToMo. If you do believe in what you’re doing, the commission is gravy. It may even help you track your progress, increasing play. That’s high-ToMo. Looking at all these processes together, it’s clear that culture is the operating system of an organization. Senior leaders can build and maintain a high-performing culture by teaching managers to lead in highly motivating ways. For example, one study of bank branch managers showed that offering high-ToMo leadership training led to a 20% increase in credit card sales and a 47% increase in personal loan sales. CEOs should make a business case for culture (with a budget) and enlist HR and business leaders to improve the elements that affect culture, from role design to performance reviews. Holding a reflection huddle with your team once a week. Teams we’ve worked with hold an hour-long huddle once a week in which each person answers three questions directed at encouraging: 1) Play: What did I learn this week? 2) Purpose: What impact did I have this week? And 3) Potential: What do I want to learn next week? Explaining the why behind the work of your team. One executive at a retail store told us she often introduced a new project by saying, “We have to do this because Linda [the boss] asked for it.” This was motivating through emotional pressure, which was hurting her team’s performance. So she started explaining why a project would help the customer instead. Considering how you’ve designed your team’s roles. Does everyone have a space to play? Think about where people should be free to experiment and make that clear. For example, a Starbucks manager told us that he lets each employee experiment with how they connect to each customer, and a bank manager we worked with said he encourages people to suggest process improvements. Then ask if everyone has the opportunity to witness the impact of their work, and think about what might help them build a stronger purpose. Finally, find out where each team member would like to be in two years — and come up with a plan to help their reach their potential. A great culture is not easy to build — it’s why high performing cultures are such a powerful competitive advantage. Yet organizations that build great cultures are able to meet the demands of the fast-paced, customer-centric, digital world we live in. More and more organizations are beginning to realize that culture can’t be left to chance. Leaders have to treat culture building as an engineering discipline, not a magical one.